Public entities - such as courthouses, hospitals, libraries, and other open facilities - are essential to our communities. That’s why the U.S. Department of Agriculture (USDA) has grants that help construct and improve buildings used by the general public. These grants cover renovation costs for emerging and small businesses. If your municipality, nonprofit organization, or small community doesn’t currently have the funds for restoration projects, these grants cover the majority of the costs. However, these grants are competitive - you must ensure that your project will benefit surrounding towns. The Federal Emergency Management Agency (FEMA) funds three programs: The Hazard Mitigation Grant Programs (HMGP), The Flood Mitigation Assistance (FMA) Program, and The Pre-Disaster Mitigation (PDM) Program. These grant programs fund planning and projects involving rebuilding private and public properties to reduce damage or loss from future natural disasters. For example, one can use funds to elevate buildings located in flood-prone areas or enhance spaces to minimize potential damage from earthquakes. These grants can also convert properties into open spaces and ensure buildings are up to code. If you inherited or purchased a historical building to act as your office or retail space, you can apply for grants from The Federal Historic Preservation Tax Incentives Program. Even though you admire your building’s aesthetic and want to preserve its old-time charm, it may not be a habitable commercial space. Through these grants, you’ll receive funding to rehabilitate historical buildings. These grants also cover energy efficiency and green building projects. Keep in mind that historical buildings will require more than just interior repairs. Like homes, commercials buildings should have strong foundations; without a structurally sound foundation, your building will suffer from severe damage. 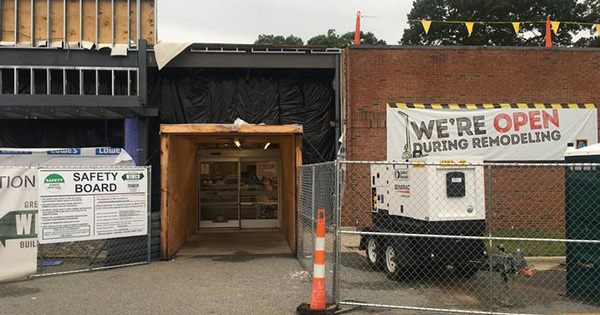 That’s why it’s important to let professionals restore your space from the ground up, and the aforementioned business renovation grants can help you do exactly that.